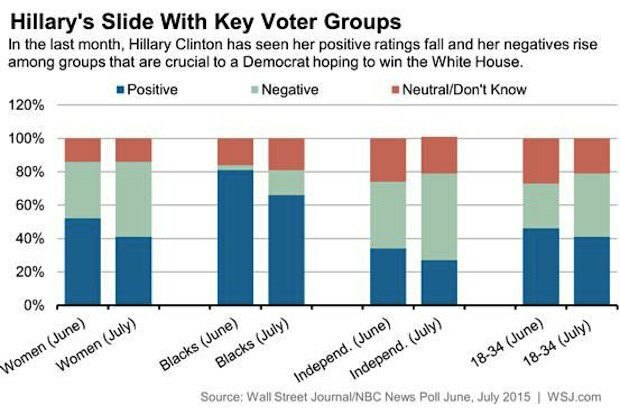 A new Wall Street Journal/NBC News poll suggests that Hillary Clinton is losing support from white women. In June, 44% of white woman had a favorable view of Clinton compared to 43% who didn't. In July, only 34% of white women had a positive opinion of her, compared to 53% who didn't. Clinton is somewhat dependent on the support of white women for her campaign, since she is unlikely to match the African-American turnout that helped Obama win two presidential victories. In the first quarter of the year, independents were about 50/50 on their perception of Clinton. But by July, only 27% had a positive image of her, compared to 52% who did not. Clinton is still in the lead among Democrats. As of last month she had 59% of Democratic primary voters' support while her closest Democratic rival, Vermont Sen. Bernie Sanders had 25%. However, in June the margin was 75% to 15%. Among white women with a college degree or more, 51% had a positive view of Clinton in June, and 38% had a negative view. In July, those numbers turned to 43% positive and 47% negative.